Fortified Italian city, on the Mincio; capital of the duchy of Mantua. It has a population of 29,160, including 1,100 Jews (1901). In 1858 it had 2,523 Jews—the greatest number in its history. The first mention of Jews in Mantua dates from the twelfth century, when Abraham ibn Ezra finished (1145) there his grammatical work "Ẓaḥot." Apparently he was in that city again in 1153. There are no further references to Jews in connection with Mantua until they are mentioned in the new statutes of the city at the end of the fourteenth century, when a large number seem to have lived there. In 1459 a special tax of 2,000 ducats was imposed on the community, though by vigorous protest they succeeded in having it reduced to 600 ducats. 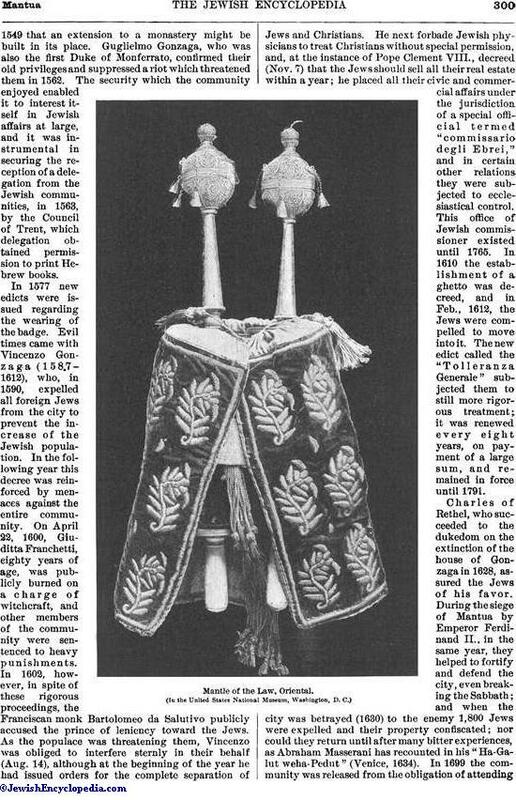 The importance of the community about that time is evident from the fact that two famous rabbis, Joseph Colon and Judah da Napoli (Messer Leon), officiated in Mantua, although, on account of their inability to agree, both were expelled from the city in 1475. In the following year, with the consent of the pope, the Jews were permitted to lend money at interest, and eight years later Bernardino da Feltre founded a "monte di pietà" there, the granting of its charter being one of the first acts of the government of the new prince, Francesco Gonzaga (1466-1519), who was generally ill-disposed toward the Jews. In 1485 he ordered all of them, with their wives, to attend Bernardino's anti-Jewish sermons. 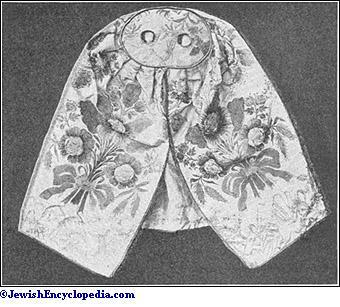 In 1496, when the preachers again demanded that restrictions be placed on courtezans and Jews, the wife of the prince, during his absence, ordered the wearing of the Jewish badge. From this time the treatment of the Jews varied, and intermittently they were favored by the princes. Although Frederick Gonzaga, the first Duke of Mantua, had a Jewish physician, Abraham Portaleone, he forbade the Jews to keep Christian servants, an exception being made in regard to necessary services performed on the Sabbath. In 1531 the Marano Solomon Molko was burned publicly at the stake during the visit of Emperor Charles V. Although the congregation had received permission from Pope Clement VII. in 1530 to build an Ashkenazic synagogue, the duke did not confirm it until 1540, at the earnest solicitation of Isaac Porto; the last-named was called to the rabbinate of Mantua in 1550, as the first of an uninterrupted succession of rabbis whose names are preserved in the communal archives. 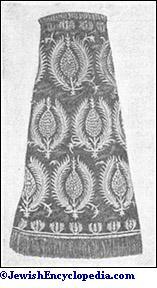 Mantle of the Law, Padua, Eighteenth Century. 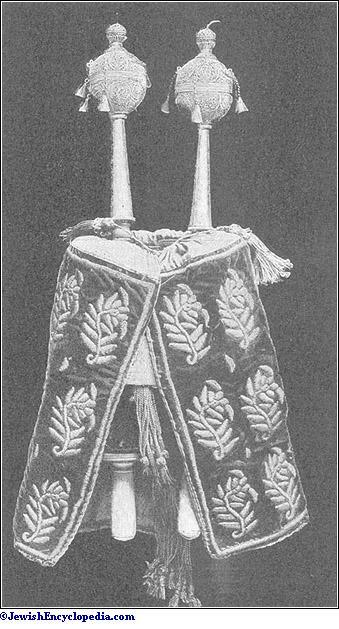 Mantle of the Law, Oriental. Charles of Rethel, who succeeded to the dukedom on the extinction of the house of Gonzaga in 1628, assured the Jews of his favor. During the siege of Mantua by Emperor Ferdinand II., in the same year, they helped to fortify and defend the city, even breaking the Sabbath; and when the city was betrayed (1630) to the enemy 1,800 Jews were expelled and their property confiscated; nor could they return until after many bitter experiences, as Abraham Masserani has recounted in his "Ha-Galut weha-Pedut" (Venice, 1634). In 1699 the community was released from the obligation of attendingChristian sermons, and about 1700 various Jews received extensive industrial privileges, and were even entrusted with the management of state domains. When Mantua came into the possession of the Hapsburgs, after the war of the Spanish succession, the Austrian governors tried to protect the Jews from the many petty annoyances which the latter had to suffer through clerical intrigues; for the decree issued in 1740 by the grand inquisitor of the Roman Curia marked the culmination of the persecution and humiliation of the Jews by Rome. In Mantua they were permitted to institute a suit for compensation for annoyance on the street on the testimony of a single witness. To avoid being insulted by the students of the gymnasium—it had become customary for the students to insult Jews whenever they met them—the Jews made a yearly payment in kind to the principal. On special occasions, as during sieges, large assessments were levied upon the community, which was especially taxed during the reign of Maria Theresa, though under her the civic status of the Jews began to improve. In 1752 the sanitary laws were declared to be equally binding upon Jews and Christians, and the restriction regarding Jewish physicians was abrogated. The condition of the Jews improved still further when Joseph II. was made coregent. In 1772 they were allowed to loan money at the "monte-di-pietà," while in 1779 many of the ancient restrictions were repealed, the badge was abolished, Jews were admitted to the public schools and were allowed to acquire real estate, and the tribunal of the Inquisition was suppressed. Under Leopold II. (1790-92) a deputation sent to Vienna succeeded in having the "Tolleranza Generale" made permanent and in securing the repeal of all special taxes on the community, while the emperor declared that he would put the Jews on an equality with all other citizens in all points compatible with the general welfare. But under Francis I. 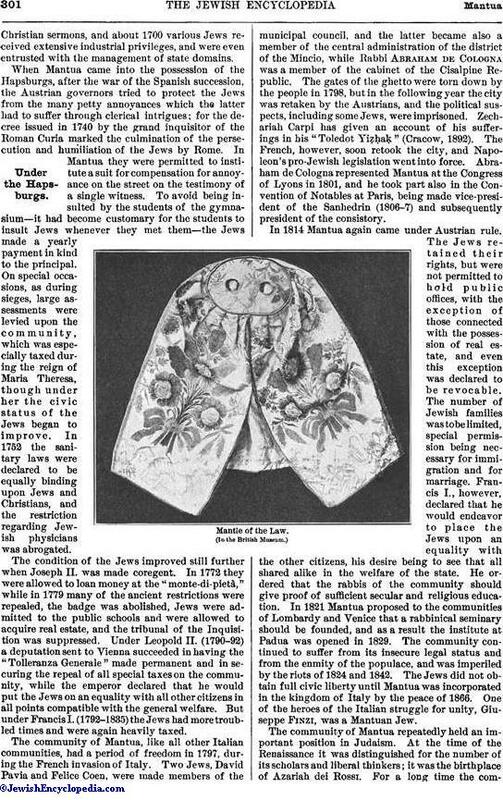 (1792-1835) the Jews had more troubled times and were again heavily taxed. The community of Mantua, like all other Italian communities, had a period of freedom in 1797, during the French invasion of Italy. Two Jews, David Pavia and Felice Coen, were made members of the municipal council, and the latter became also a member of the central administration of the district of the Mincio, while Rabbi Abraham de Cologna was a member of the cabinet of the Cisalpine Republic. The gates of the ghetto were torn down by the people in 1798, but in the following year the city was retaken by the Austrians, and the political suspects, including some Jews, were imprisoned. Zechariah Carpi has given an account of his sufferings in his "Toledot Yiẓḥaḳ" (Cracow, 1892). The French, however, soon retook the city, and Napoleon's pro-Jewish legislation went into force. Abraham de Cologna represented Mantua at the Congress of Lyons in 1801, and he took part also in the Convention of Notables at Paris, being made vice-president of the Sanhedrin (1806-7) and subsequently president of the consistory. In 1814 Mantua again came under Austrian rule. The Jews retained their rights, but were not permitted to hold public offices, with the exception of those connected with the possession of real estate, and even this exception was declared to be revocable. The number of Jewish families was to be limited, special permission being necessary for immigration and for marriage. Francis I., however, declared that he would endeavor to place the Jews upon an equality with the other citizens, his desire being to see that all shared alike in the welfare of the state. He ordered that the rabbis of the community should give proof of sufficient secular and religious education. In 1821 Mantua proposed to the communities of Lombardy and Venice that a rabbinical seminary should be founded, and as a result the institute at Padua was opened in 1829. The community continued to suffer from its insecure legal status and from the enmity of the populace, and was imperiled by the riots of 1824 and 1842. 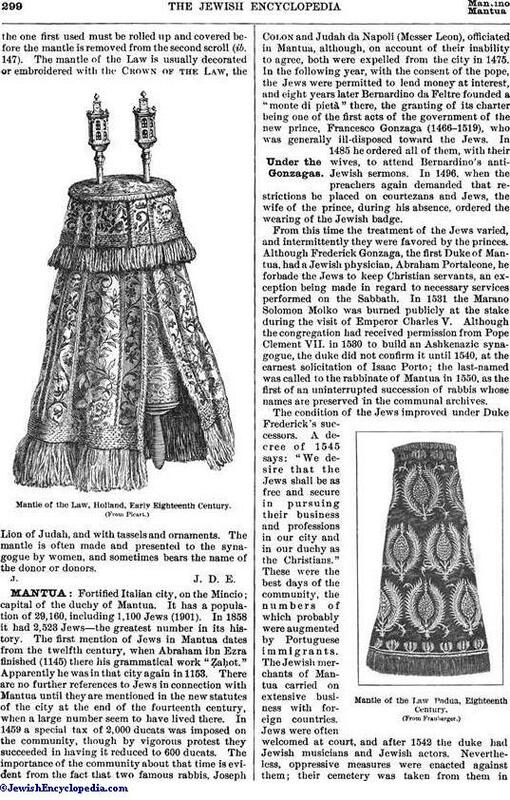 The Jews did not obtain full civic liberty until Mantua was incorporated in the kingdom of Italy by the peace of 1866. One of the heroes of the Italian struggle for unity, Giuseppe Finzi, was a Mantuan Jew. (In the British Museum. )Scholars and Rabbis. The community of Mantua repeatedly held an important position in Judaism. At the time of the Renaissance it was distinguished for the number of its scholars and liberal thinkers; it was the birthplace of Azariah dei Rossi. For a long time the communitywas obliged to furnish to the dukes of Gonzaga a company of actors who from 1525 to 1597 gave dramatic representations, which form an important chapter in the early history of the Italian stage. The dramaturge of the company, Leone Sommo, produced in his "Dialoghi sull' Arte Rappresentativa" the first work of its kind; in recognition of his merits as a poet he was made a knight, and a member of the Academy of Padua. Among the Jewish musicians at the court of Mantua were the harpists Abraham dell' Aspra and his grandson; Isacchino Massarano was distinguished as a lutist, a singer, and a dancing-master; Solomon Rossi was known as a composer of religious and secular songs, while his sister Europa was a singer, and her son Anselmo and Davide Cività were esteemed as composers. Mordecai Finzi was a mathematician and Abraham Colorni an engineer. Mantua was foremost, also, in the sixteenth century in the field of Jewish science. As a century previously Joseph Colon had taught there, so now the brothers Moses and David Provençal were famous as Talmudists, founding the rabbinical academy which flourished down to modern times; while a third brother, Judah Moscato, was famous as a preacher and philosopher. The brothers Provençal were so enthusiastic in the cause of science that David and his son Abraham determined to establish a university in their house (1564), and issued a detailed prospectus inviting students ("Ha-Lebanon," v. 418 et seq. ; "Berliner Festschrift," pp. 164 et seq.). Subsequently Mantua became the chief seat of the cabalists. The community of Mantua has had many famous rabbis, and a number of rabbinical families whose members succeeded one another in office. The most noteworthy names are: Basilea, Brieli, Cases, Cologna, Fano, Jarè, Modena, Mortara, Moscato, Portaleone, Provençal, Dei Rossi, Romanelli, Saraval, Viterbi, and Zacuto. Marco Mortara officiated from 1842 until 1894, and was succeeded by Isaiah Levi. Since the sixteenth century the community has had six places of worship: Scuola Grande (built 1537), transferred a century later to its present site); Scuola Norsa Torazzo (founded 1513); Scuola Cases (founded 1590); Scuola Beccaria (founded in 1595 over a slaughter-house and named after it); Scuola Porto (founded 1540); and Scuola Ostiglia (founded 1558). In the first three the Italian ritual is followed, in the last three the German. Their foundations have recently been in part united. The community owns a large library containing numerous manuscripts and important archives, from which Stern has published a number of documents. Among Mantua's philanthropic institutions is the Casa di Ricovero, an asylum for the aged founded in 1825 and connected with a foundation for the promotion of trade and industry among the Jews and a home for apprentices. In 1834 Samuele Trabotti devoted his entire fortune to a fund for dowering Jewish brides, educating Jewish youths in the arts and sciences, establishing prizes for artisans, and relieving the sick and the poor. This richly endowed foundation absorbed the existing institutions of similar character. Zunz, Z. G. pp. 249 et seq. Mantua was among the earliest places at which Hebrew works were printed. The physician Abraham Conat started printing there as early as 1476, when he produced the Ṭur Oraḥ Ḥayyim; some of his productions may have been begun even in the preceding year. He had the merit of producing the only Hebrew incunabulum published during its author's lifetime—"Nofet Ẓufim." His wife, Estellina Conat, made herself responsible for the "Beḥinat 'Olam," issued from his press after his death. In the printing of Levi ben Gershon's Pentateuch, Conat was associated with Abraham of Cologne, possibly identical with the Abraham de Tintori who afterward emigrated to Bologna. Hebrew printing was resumed at Mantua in 1513 by Samuel Laṭif, who appears to have been forced from business a year later by the competition of the Soncinos. The next printers of Hebrew books were Christians—the Rufinellis and Philipponis (1561-97); their printer's sign was a peacock. A large number of Jewish workmen, including Meïr Sofer, his son, and his son-in-law, were employed by them. In the seventeenth century Eliezer de Italia started a Hebrew printing-press (1612), being followed by Judah di Perugia in 1622. In the eighteenth century Isaac Jarè and Raphael Ḥayyim di Italia printed at Mantua. 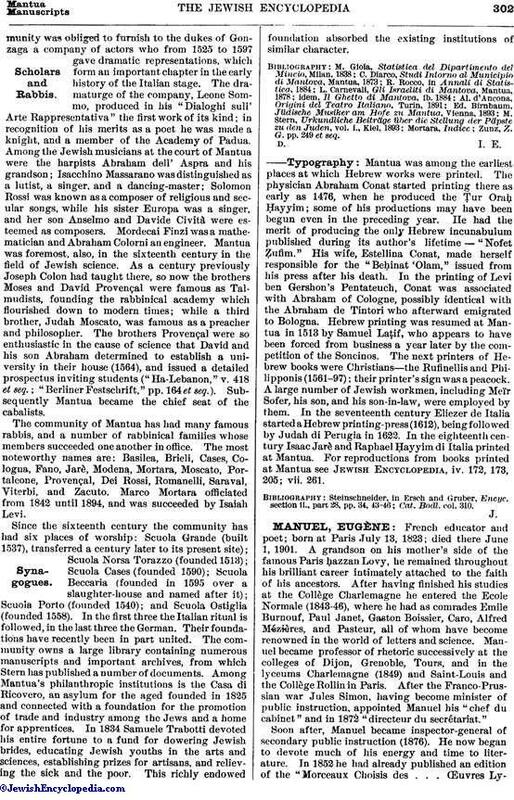 For reproductions from books printed at Mantua see Jewish Encyclopedia, iv. 172, 173, 205; vii. 261.